The most unique swim spa to hit the market, featuring the leading innovative design. The FX 219 has separate filtration, heating, and controls for the swim portion and the hot tub. 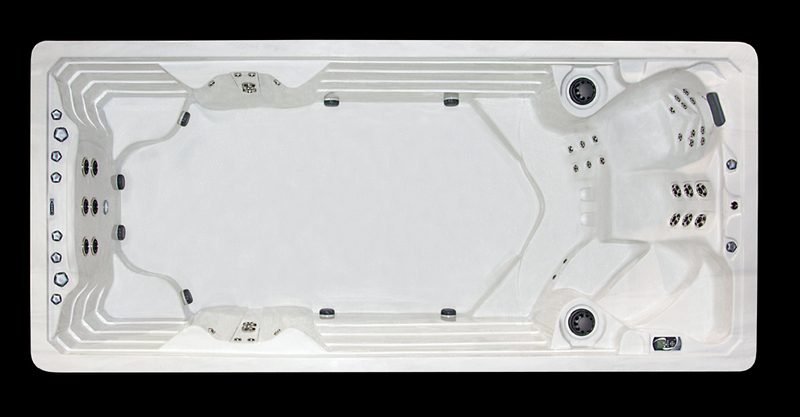 A new cover design allows you to control what sections you want open; the hot tub, the swim spa, or the entire unit. A very large 9’-10” flat bottomed, barrier free workout area allows for plenty of space for swimming or water workouts. Relax your muscles in the one of a kind RX6™ stand up jet systems or the two contoured seats of the swim side, great to use before or after workouts! Enjoy the full size hot tub anytime. With 38 powerful jets your muscles will be relaxed and your tensions gone, leaving your body fully rejuvenated. ** Retail $35,357.00 -R7Dinc wholesale discount as noted plus Tax & delivery.